Sections: Jump to a section by clicking on its name. As the name implies, green coffee bean extract (or "green coffee extract") is an extract from raw, green coffee beans -- the same beans which are used to make coffee if roasted. The extract contains substantial amounts of polyphenolic antioxidants known as chlorogenic acids (CGAs) -- comprising as much as 50% of most extracts. It is these compounds which are believed to be important to the activity of green coffee extract in the body. The extract also naturally contains some caffeine -- up to about 4% of the extract. Svetol®, from Berkem/Naturex, is an extract made from decaffeinated green coffee beans. Svetol® contains 45% to 50% total CGAs (about one-third of which is the specific compound 5-caffeoylquinic acid (5-CGA), and less than 2% caffeine. GCA®, from Applied Food Sciences Inc, contains 45.9% total chlorogenic acids and 2 to 4% caffeine. 200 mg twice per day (400 mg per day) of extract (Svetol®) for 12 weeks showed a mean weight loss of 10.9 lbs (4.97 kg) vs. 5.4 lbs (2.45 kg) for placebo. Weight reduction was somewhat higher than in other studies as a bland, low-calorie diet given to both groups (Dellalibera, Phytotherapie 2007). 200 mg daily of extract (Svetol®) added to instant coffee for 12 weeks showed a mean weight loss of 11.9 lbs (5.4 kg) vs. 3.7 lbs (1.69 kg) for placebo. (Thom, J Int Med Res 2007). Sugar (as glucose) was added to the coffee, but there was a 6.9% reduction in glucose absorption among those getting extract compared to those getting placebo. 350 mg given two times per day (700 mg per day) or three times per day (1,050 mg per day) of extract (CGA®) for 6 weeks showed a mean weight loss of 3.4 lbs (1.54 kg) and 4.5 lbs (2.04 kg) and for the lower and higher doses, respectively, vs. 0.7 lb (0.32 kg) for placebo (Vinson, Diab, Met Synd and Obes, 2012). Statistically significant decreases in body mass index (BMI) occurred in both treatment groups, but not placebo. The study was done in such a way that each participant actually received, in different sequences, both types of treatment and placebo over a 22 week period (2 weeks between each treatment) over which time the total mean weight loss was 17.6 (8 kg). In addition, a very short-term study conducted by The Dr. Oz Show in 2012 involved giving 100 women 400 mg of a proprietary green coffee extract three times daily (30 minutes before each meal) or placebo. There were no special changes in diet or exercise. Over the two-week period of the study, those taking the extract reported a 2 lb weight loss versus a 1 lb loss among those taking placebo. It is interesting that the participants lost in just two weeks about the same amount of weight lost per month in published studies. A possible explanation is that more weight loss occurs during the initial weeks of treatment. Exactly how green coffee extract may work is not known. However, there is some evidence that it inhibits an enzyme (hepatic glucose-6-phosphatase), reducing glucose production and glucose levels -- a potentially anti-diabetic effect (Henry-Vitac, J Ag Food Chem, 2010). This may force the body to use fats as energy, instead of glucose. Futurebiotics Green Coffee Bean Extract contained 81.2% of its claimed 200 mg of total CGAs per capsule (i.e., instead of total CGAs being 50% of the extract as claimed, it was 40.6%). M?ritzMayer Laboratories Pure Super Green Coffee Bean Extract Double Strength contained only 13.8% of the minimum total CGAs expected by ConsumerLab.com (i.e., instead total CGAs being 45% of the extract, it was only 6.2%). Nutri-Fusion Systems Green Coffee Bean Extract contained no detectable CGAs, including none of the listed 5-CQA (a type of CGA). It also had no detectable caffeine. Pure Health Naturally Pure Green Coffee Bean contained only 64.4% of the minimum total CGAs expected by ConsumerLab.com (i.e., instead of total CGAs being 45% of the extract, it was only 28.9%). Three supplements passed testing as did another four tested through ConsumerLab.com's Voluntary Certification Program. These products suggested daily dosages ranging from 400 mg to 2,400 mg. Clinical studies have used approximately 200 mg to about 1,200 mg per day, and it's not at all clear that taking more than in this range is desirable. However, most dosages involve taking multiple capsules, so you can adjust the daily dosage. In terms of cost, the most economical product was Vitacost Green Coffee Bean Extract 400 mg capsules at 20 cents per 400 mg. Several other APPROVED products were close in cost per 400 mg of extract: Paradise Herbs, Green Coffee Bean (23 cents), Life Extension Green Coffee Extract CoffeeGenic™ (24 cents -- and is made with GCA®), and Labrada Nutrition Green Coffee Bean Extract (27 cents) -- see the last column of the table below for more price comparisons. The two APPROVED products containing Svetol®, Vitamin World Green Coffee Bean Extract and Reserveage + Advanced Solutions Green Coffee Bean Extract w/Raspberry Ketones, were considerably more expensive than most products, costing, respectively, 83 cents and 98 cents per 400 mg of extract. 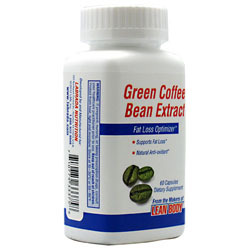 Listed below are the test results for thirteen green coffee bean extract products. Nine products were selected for review by ConsumerLab.com and four products passed the same testing in the Voluntary Certification Program. If a product is listed as APPROVED, it was found to contain the labeled and expected amounts of compounds and did not exceed CL's stringent criteria for lead or cadmium contamination. The full list of ingredients and nutrients is available for each product by clicking on the word Ingredients in the first column. For more information about testing go to How Products Were Evaluated. Dist. by Genesis Today, Inc.
Dist. by Nutri-Fusion Systems, Inc.
Dist. by Paradise Herbs & Essentials, Inc.
1 Not tested but claimed on label. 3 Label says "Each serving contains approximately 12 mg of caffeine per serving (the amount found in � cup of coffee)." Per the USDA (below) a quarter cup of coffee contains 24 mg, so a range is shown in the table above. 4 USDA level of caffeine in 1 cup of brewed coffee is estimated to be 95 mg (USDA National Nutrient Database 2012). 5 Product is a food and not a supplement and no suggested daily servings listed. 6 No claimed amount of Green Coffee Bean Extract, therefore unable to calculate the minimum percentages. 7 The term "5-CQA" is used by some laboratories and manufacturers to refer to the predominant chlorogenic acid isomer in green coffee bean extract, which may more accurately be classified as 3-CQA. In this Review, ConsumerLab.com has accepted this usage of the term until greater consensus is reached. Unless otherwise noted, information about the products listed above is based on samples purchased by ConsumerLab.com (CL) for this Product Review. Manufacturers may change ingredients and label information at any time. SO be sure to check labels carefully when evaluating the products you use or buy. If a product's ingredients differ from what is listed above, it may not be the same as what was tested. For each product, the sample was composed of one of more products from a lot having an expiration date (if labeled) later than the date of testing. Because ingredients and labeling may vary from lot to lot and there may be a lack of consistency within lots. CL can not assure that results for other samples will be the same as those listed above. The information contained in this report is based on the compilation and review of information from product labeling and analytical testing. CL applies what it believes to be the most appropriate testing methods and standards. The information in this report does not reflect the opinion or recommendation of CL, its officers or employees. CL cannot assure the accuracy of information provided.